So you want to learn about Travel, welcome to the world of Travel. I have become an expert on street children and their habits quite by accident. Maybe it would be better to say, street families. You search for street families’ right before the sun rises, they will be sleeping in the street, go figure. This little cute thing volunteered for a photo yesterday. “Too Cute for Words” contest. There are many NGO’s that work with Street Children; these up to No Good Organizations allow you to donate money so you relieve guilt. I am not sure why people feel guilty when they see street children, but I am positive most do, I for one, feel a little compassion mixed up with annoyance. I was walking down a street in the aftermath Typhoon Ondoy. I am sure CNN and BBC would label and the wrath and destruction caused by the Typhoon. "If they are sleeping in the streets now, the truly are homeless." Alcoholism is the cause of the majority of Street Children on planet earth. What happens is this, the NGO people getting drunk all night, then sleep until about noon. The then go out searching for Street Children. Well, Alcoholics arrived confused, live confused and write up zealous statistics about street children. I would say there is one-fifth the amount the NGO wants to collect for, poverty is always overestimated. The alcoholic NGO has made street children out of bums. Now, as I turned the corner walking in the middle of the street to keep my new shoes clean and out of the water, I spied this little girl over by a store window. The child comes toddling over to the edge of the road, I stop and look around. Hmm, where is the mother, for some reason there is no mother. It is wet and dirty where I am at, or just the normal Malate area with a lot of water. Where is the mother of this small child? I can see the girl is defenseless. I pull out my camera and take two photos. There is no mother protect here, there is no mother to come chasing me down demanding money. The little girl is too young, not sure, how to hold out her hand yet so I walked up and gave all the change I had in my pocket. It was sad, her, little hand was too small for this amount of coins. I was about to give here a 100 pesos, but two street urchins, the full size versions came running up and demanding money. I think they would have rolled the little girl and taken her money if they could. 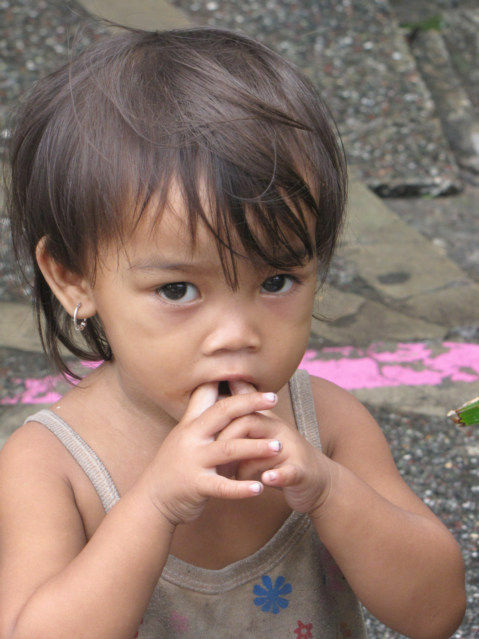 Street Children can be found in early morning. Street Children sleep in the street. 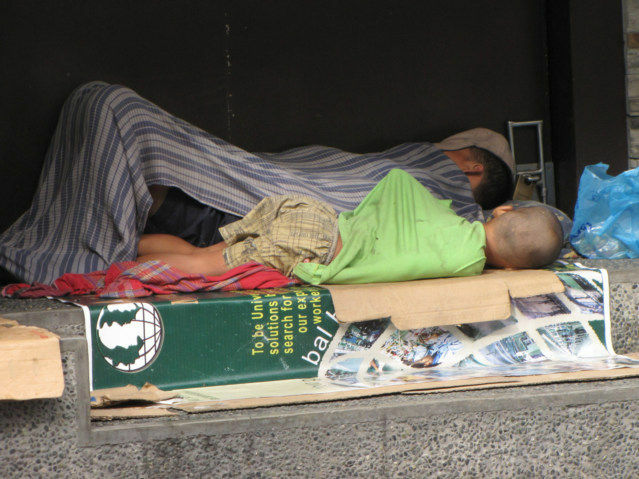 If you want to search for Street Children, you cannot be an alcoholic and sleep until noon. You must wake up around 5:00 am and walk around right before the sun rises. If you are really brave, walk around 4:00 while it is still dark, but the photos will be difficult. I enjoy taking photos of street children, it is basic, and they are cute and lovable in most ways. Life is basic, simple and primitive, I am doing what I can, no more, no less, and my life is at street level. Is there a solution for street children? Is there a solution for Poverty? NGO’s feed us tons of guilt relieving crapola sandwiches, you can donate money and the up to No Good Organizations will drink more. I am tired of explaining this, nobody cares. This is a street family in Manila, Philippines; this type of photo is incredibly easy to take in the Philippines. People who are street children sleep in the street. I never found the mother of the small girl, ok, I admit it; I walked on down the road and forgot her. I do not deny it, I will do my best to forget her, and maybe it will work. I am sure I will forget her, there are too many of these little children living in my brain. How could I remember just this little one, she is not important. Do not send money, 11 years of travel, there is no solutions at street level. Is there a United Nations program to force countries into providing social security programs? I need to go back to Africa where there is less poverty, crime and street children. Sorry, I am not doing good at keeping my mouth shut again. Andy, you did more to shine a true light on the problem with this blog and your youtube video (walking around the block from the Hyatt) than 1000 air brushed NGO brochures. BUT, doesn't it break your heart? I think it does break my heart, I continue to take the photos, therefore I am still feeling the photo, I am not able to just ignore. Many people take photos of maybe how they want life to be, I strive to take photos of how life really is, whereby I hope to include this little girl in my life. If by chance, I better my world, I always want her to know she is part of my life and is included in my good fortunes. I do not feel separated, there is not me and them, the haves and have nots. She was just a little cute girl along my path, she deserves a better chance. People have babies, call it love, but it is fear. They are afraid nobody will take care of them when the are old, so they have many gambling that one will love them out of the litter. The UN needs to put pressure on countries like the Philipppines so it becomes difficult to find this photo. Pre-set ready to go business ventures that I could hand out to poor families. I made this video of how to cut up a pineapple as a gift to Africa, a great business method that should be done in Africa also. Problem I have Chuck is the failure to thrive business problem. If I give them a wooden box full of nuts, cigarettes or what not, they are doing a the same same same, not different business as all the Sari Sair stores. I see many type of business ventures, for example in Colombia they made truly delicious hot cooked potato chips in the streets. In Benin Africa, they pealed Oranges in special way that made them easy to eat. What I feel is we need small Entrepreneurial ideas that are new, novel and can help to distribute the wealth. These ideas need propagated by people. For example, I could take the Pineapple cutting system to Africa, train them, set up a glass case showing the whole way of doing this and hope is copied. The Philippines does not market Pineapple as good as Thailand, this could be done here also. I have tried on many occasions to get donation to give directly to families. I do not paint a sad sack, I am Gods Messenger type of page. I am not going to feel endless sad stories to people to get a donation. I am an honest guy, People who donate are often saps, they need to read only good things, only a dishonest person would word things in the way they need to hear it. HoboHideOut.com is meant to be the endless fountain of Internet money of me, I have nothing better to do, may as well help out. If I got 10 dollars donated, I could give it to the mother, would this help? I doubt it, it would guarantee she did NOT stop being a beggar, too much money to quit. "Now sell me a Chiclets." Good thinking Chuck, everything cost money. I gave 200 dollars worth of jackets to Peru people, nobody donated a penny to me when I asked for donations for the project. I will continue to think, try and help, but I refuse to make beggars by giving profitable amounts of money. I gave the little girl money because she need to upgrade one level of poverty. She was losing too far...rain, cold, typhoon and she is in the streets, 95 percent of the others were not to be found.